In Pevsner the City of York appeared in the volume York and the East Riding and I followed this form in these pages. However, the City of York appears to have been in the West Riding, the most industrial of the three former divisions of the County of Yorkshire; in more recent times it is now in North Yorkshire. So here I will break with form and give the City of York a pages to itself' rather like Bristol. The RCHM began an excellent series of their inventories on York, there being five volumes with the last being the Central Area. I impatiently waited for Volume 6, The Minster but the RCHM was then in its dying days and it never appeared. Instead were issued a poorer and expensive series on York Minster: The Findings Volume 1 (in two parts), The Findings Volume 2 and Architectural History. And that was it: the inventory for which we had waited never appeared. Park in one of the car parks outside the city walls: those just outside Bootham Bar are the most convenient; they are expensive! York Minster is a Cathedral of the Old Foundation: at the Reformation it was governed by a dean and secular canons not by a prior and monks. Cost of visit (church, chapterhouse and undercroft) t: £10 (adults), £9 (students/seniors), up to 4 accompanied children free. Plus tower: £15/ £14 but £5 for children 8-16. There's even a turnstile but the staff are very helpful, friendly and courteous. 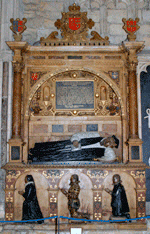 Above: said to be the tomb of Archbishop Roger de Pont l'Evêque (1181), although the monument is late 15th century. 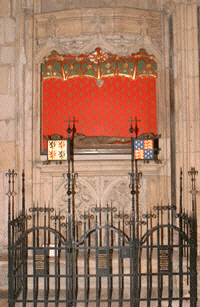 He was appointed to York by Henry II and an opponent of Becket. 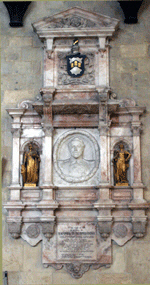 Right: James Cotrel or Coterel (1595) Brass with Latin inscription. 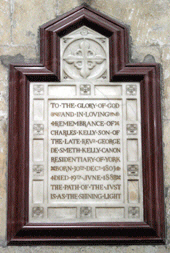 A native of Dublin who came to York to work for the Council of the North. 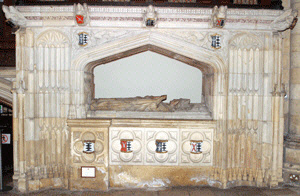 prepared for him in the Minster, permission for burial was refused by the Home Office and he was buried at Helmsley. 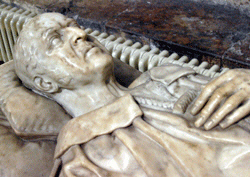 Archbishop William Thomson (1890) Designed by George Frederick Bodley; effigy (signed) by Sir John Hamo Thornycroft RA and remainder of carving by Farmer & Brindley Ltd, London. 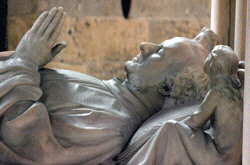 He was called 'The People's Archbishop', compelled clergy to live in their parishes and was at loggerhead with Deans Duncombe and Purey-Cust over his status in the Minster. 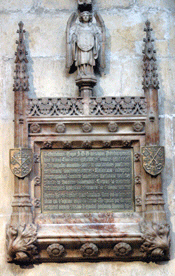 Bottom: Thomas Haxey (1425) Treasurer. Only the cadaver effigy remains and this is difficult to see behind the grill. Right: Lt Col Christopher Edward Thomas Oldfield CB (1850) by Mathew Skelton (signed). Far Right: Jane Hodson (1636) Latin inscription. 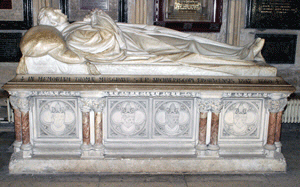 She was wife of Phineas Hodson, Chancellor of York. They had 24 children and she died in childbirth aged 38. Buried in the Minster. Dean Henry Finch MA (1728), Catherine Stanley (1731), Canon Edward Finch MA (1737) & Hon Mary Finch (1741) Busts by Rysback. 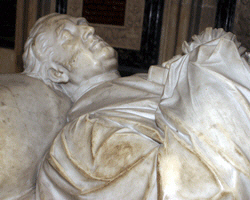 The clergy brothers are represented by the busts with Latin inscriptions. 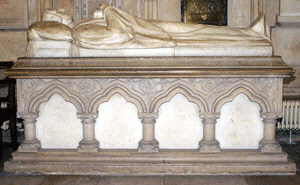 Mary, wife of Edward, and her sister, Catherine, by the urn with English inscription. Gravestones now lost. 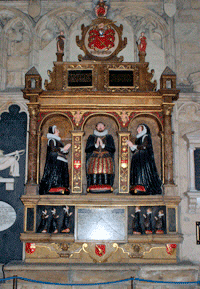 Sir William Gee (1611) & 2 of his wives: Thomasine (1559) & Mary (1649) He and Mary were buried in the Minster; Thomasine at Beverley. Latin inscription. Politician. Nicholas (1617) & William (1577) Wanton. 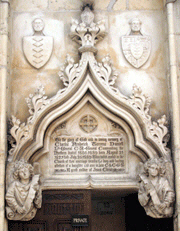 Brothers, both buried in the Minster. Inscription in Latin. Originally opposite. 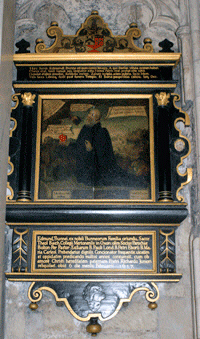 Edmund Bunney BD (1618) Painted wooden panel. Latin inscription. He was disinherited by his father for entering the church, where he held several preferments, including that of sub-dean of the Minster. Archbishop John Dolben (1686) by Grinling Gibbons 1688. Latin inscription. He joined the Royalist Army at the outbreak of the Civil War, being wounded at Marston Moor. Rt Hon William Wickham (1840) by John Ely Hinchcliffe, signed. English inscription. Buried at Brighton. 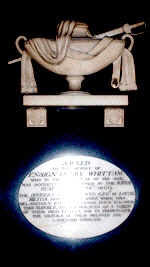 Below is a brass tablet to Archbishop Robert Holgate Ensign Henry Whittam (1809) English Inscription states he was accidentally drowned in the Ouse. 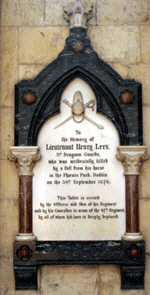 Buried in Holy Trinity, Micklegate, where there is another monument. William Burgh (1808) signed by Richard Westmacott. English inscription. Faith holds a cross and a copy of Burgh's book on the doctrine of the Trinity. MP in the Irish Parliament. (1691) Latin inscription. By Grinling Gibbons; it cost £100. 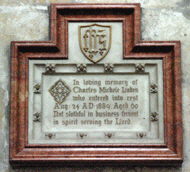 Canon Thomas Lamplugh (1747) English inscription. He was grandson of the Archbishop. Buried in the Minster. Also commemorated on the floor slab of his widow, Honor. 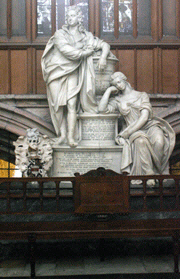 Francis (1807), John (1820) & Judith Croft (1824) by Michael Taylor. Latin inscription. John & Judith were the parents of Francis. 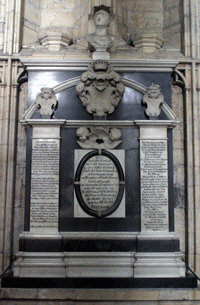 Each buried in the Minster Lady Mary Hore (1798) Latin inscription. 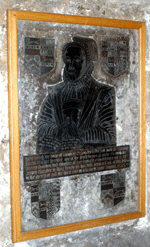 Buried in the Minster, stone lost Elizabeth Eynnes (1585/6) Brass. English inscription. 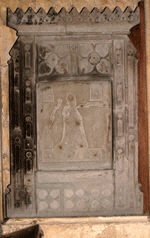 There was a table tomb to her husband Thomas at the foot of this brass in the S Transept; this was demolished in mid 18th century when the floor was re-laid. 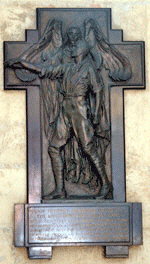 Mjr Herbert Augustine Carter VC (1916) Black marble with bronze figures. By Sir Bertram MacKennel of Melbourne, Australia. English inscription. Awarded VC for saving life of a private soldier in India 1903. KIA in German East Africa. Buried at St Erth, Cornwall where there is another monument. Rev George William Anderson (1785) & Mrs Lucy Anderson (1830) Signed J Fisher Sculp York (either John I or II) English inscription. 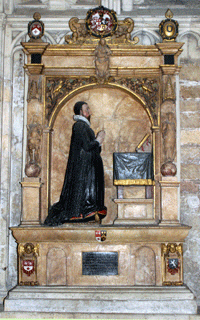 Rector of Epworth, Lincs. 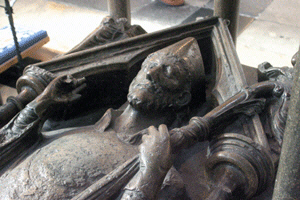 Buried in the Minster. 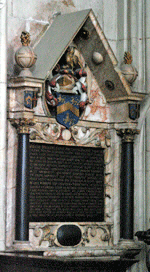 Lt Gen Charles Frederick Torrens Daniell (1889) Designed by George Frederick Bodley; executed by Farmer & Brindley. Part of a vestry doorway. English inscription Lt Henry Lees (1876) The English inscription states that he was accidentally killed by falling from his horse in Phoenix Park, Dublin. HRH Albert Victor Christian Edward, Duke of Clarence & Avondale (1892) By George Walter Milburn (signed) English inscription. Eldest son of the then future Edward VII. 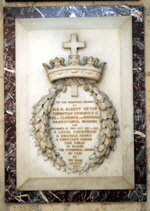 Buried in Albert Memorial Chapel, Windsor. Frederick Vyner (1870) By Thomas Earp of Lambeth. English inscription. He was kidnapped, with other travellers, and murdered by Greek brigands while returning from a visit to Marathon. Captain William Maurice Marter (1900) Veined white marble. 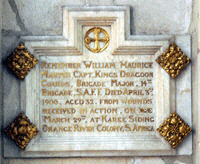 He died of wounds received in action at Karee Siding, Orange River Colony, S Africa. 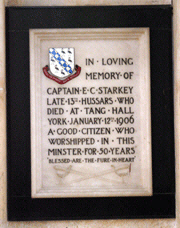 Captain Edward Charles Starkey (1906) Black and white marble. Sir Thomas Davenport (1786) signed J. Fisher York (John Fisher I) English Inscription. MP & sergeant-at-law. 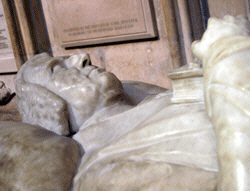 Buried in the Minster; no stone The Hon Dorothy Langley (1824) by Michael Taylor. English inscription. Also commemorated on floor slab with her husband. Vice-Admiral Henry Medley (1747) By Sir Henry Cheere. The sarcophagus has a relief of a naval battle. English inscription. Died at sea near Genoa, Italy. 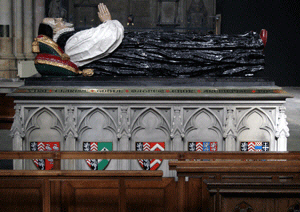 Body preserved in rum and buried in St Michael-le-Belfry, York as he wished. Charles Howard, Earl of Carlisle (1684/5), Sir John Fenwick (1696/7), Lady Mary Fenwick (1708) C.Howard was Lady Mary's father and Sir John her husband. English inscriptions. Various attributions. 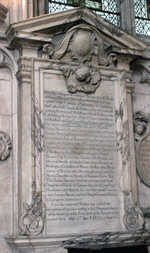 Fenwick was executed for treason for part in a plot to restore James II; buried in St Martin-in-the-Fields. Others buried in Minster. Sir William (1623) & Lady Catherine Ingram & their son Sir William Ingram (1670) The father was a Canon of York and a civil servant. Above: Eleonora Swinburn (1787) signed J Fisher Sculpr York ( John I) ES only inscription. Grave marker on floor. 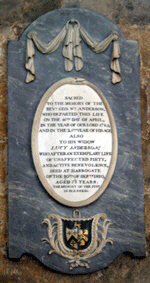 Below: Annabella Wickham (1625) Latin inscription. 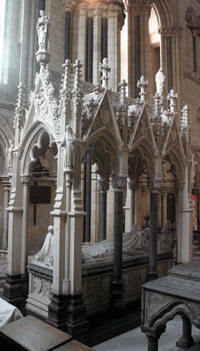 Buried in the Minster. Thomas Watson Wentworth (1723) Designed by William Kent, executed by Giovanni Baptista Guelfi (signed B. Guelfi Romanus Fecit) English inscription. 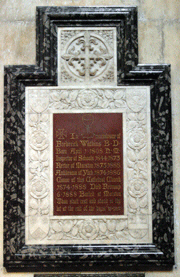 He was 3rd son of Edward Watson, 2nd Ld Rockingham, and Anne Wentworth, daughter of Th. 1st E of Strafford. He assumed the Wentworth surname on succeeding to the Strafford estates. Buried in Strafford vault. 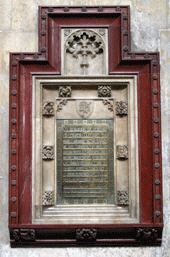 Henry Swinburne (1624) Latin inscription. 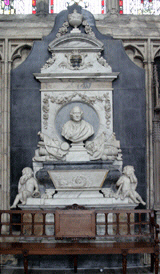 The right niche on the base was shown in a drawing of 1736 to contain the kneeling figure of his wife; the other niche was intended for his son. He was a distinguished ecclesiastical lawyer. Mrs Anne Thompson (1791), Rev Richard Thompson (1795) & Anne Thompson (1835) Ascribed to either Michael Taylor or the Fishers. English inscription. 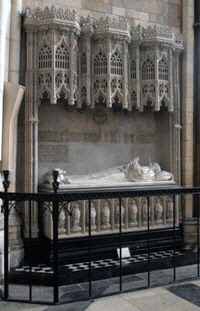 Buried in the Minster but only the stone of the daughter, Anne, survives. Sir Henry (1624) & Lady Ursula Bellasis by Nicholas Stone 1616. Latin inscription. 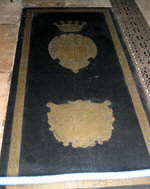 Bishop John Haton (1516) Brass matrix. Latin inscription lost but recorded. Bishop of Nigropontus. 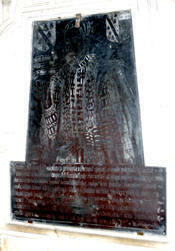 Buried in Minster Dean Bryan Higden (1539) brass matrix. 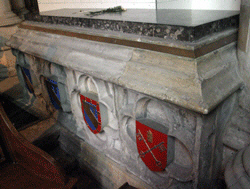 The original arms and the English inscription were recorded and there is now a painted inscription on the base. A lawyer who held several ecclesiastical offices. Buried in the Minster. 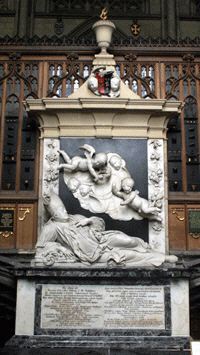 Above and right: Archbishop Richard Sterne (1683) by Grinling Gibbons. Latin inscription. 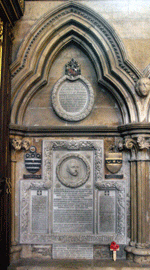 Chaplain to Archbishop Laud and arrested for attempting to send the plate from Jesus College, Oxford to help the cause of Charles I. He attended Laud at his execution. A vigorous opponent of the Puritans. Far right: Sir George Savile, Bart (1784) by John Fisher of York. The scroll he holds in this right hand reads: 'Petition of the Freeholders of the County of York.' English inscription. A 'radical' MP for Yorkshire who never accepted public office. Monument paid for by public subscription. Buried at Thornhill. 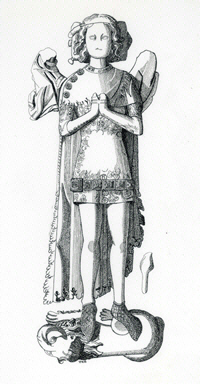 Prince William of Hatfield (1337) Second son of Edward III and Philippa of Hainhault; born 1336 and died by 1337; although the effigy represents a boy of about 8. Alabaster effigy. The above three monuments have all been moved from their original sites and are now lined up in the present position. Canon Stephen Creyke (1883) Brass set in red and white marble frame. English inscription. 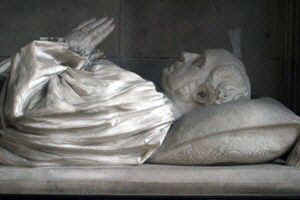 Archdeacon of York 1845-66 Charles Kelly (1882) White marble with red marble frame. English inscription. Frederick Watkins (1888) English inscription. Rector of Long Marston, Archdeacon of York 1874-86. Buried at Long Marston Canon William Hey (1882) English inscription. Vicar of St Olave's, Marygate, York. 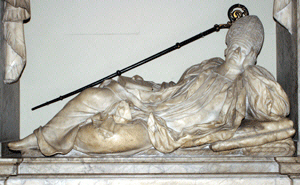 Archbishop John Sharp (1714) semi reclining figure on black sarcophagus; reredos of 4 pillars; drapery looped back for inscription. By Bird. 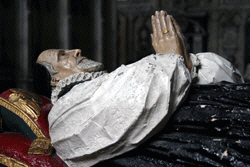 Left bottom & above left: Archbishop Toby Mathew (1628) The effigy, from an earlier monument, was put on the tomb chest (designed by Sydney Smirke) in the late 19th century. Latin inscription on brass surround. The original Latin inscription which was destroyed in the major fire in 1829 (which affected many monuments) was recorded. 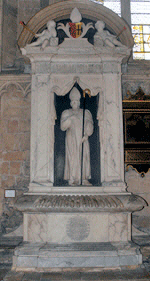 Archbishop Richard Scrope, who had at first remained neutral, certainly initiated the northern rebellion against the first Lancastrian King, Henry IV, perhaps drafting, but certainly approving, manifestoes against the King which were being circulated and posted on church doors in York, the accusations being similar to those made by Hotspur at an earlier rebellion. The Archbishop and the Earl Marshal gathered an army outside York with the intention of going north to meet up with the Earl of Northumberland. Ralph Neville, Earl of Westmorland (who had remained loyal to the King, perhaps because the rival house of Percy Earls of Northumberland was constantly disloyal), with Prince John, Henry's son, met up with the rebels at Shipton Moor, six miles outside the city. Although promising to parley with the Archbishop and persuading him to disband his army, he arrested the Archbishop and the Earl Marshal as traitors and they were taken to Henry at York. Despite pleading from the Archbishop of Canterbury, who had hastened to York, both the Archbishop and Earl Marshal were beheaded, after a quick trial, outside the city. Miracles were soon reported at Scrope's tomb. For this act Henry received absolution from the Pope. The King had generally been lenient towards those who took part in the many rebellions against him, executing only the principal leaders, but with the Archbishop it was different. When Henry became seriously ill shortly after the execution, he may well have started to agree with those who felt that this was God's punishment for the execution of an Archbishop. Anne Bennt (1602) by Nicholas Stone in 1615 for £15. Latin inscription. Edward Tipping (1798) English inscription. Buried in the Minster. 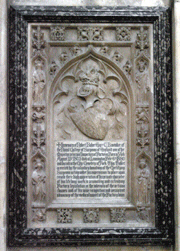 Archbishop John Piers (1594) Latin inscription. 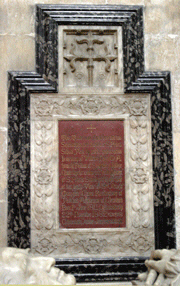 Buried in the Minster Lt Gen Herbert Eversley Belfiels (1934) & Mrs Evelyn Mary Benfield. 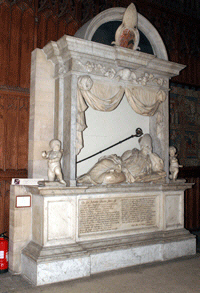 Ashes buried in Minster William Wentworth, 2nd Earl of Strafford (1695) & Lady Honoria (1685) Probably by John van Nost. English inscription. Buried in a marked vault nearby. Dr John Dealtry MD (1773) signed Fishers (probably John & Samuel) to a design by Precentor William Mason. Figure of Hygeia: note serpent around staff. English inscription. 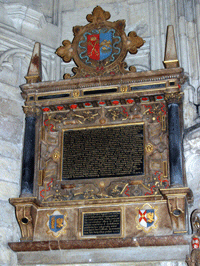 Buried in the Minster Lionel Ingram (1628) Latin inscription. He died aged 6 Canon Samuel Brearey (1736) English inscription. Buried in the Minster. Ann Sterne (1738), Richard Sterne (1744), Mary Sterne (1745), Mary Pulleyn (1786) Signed J Fisher, Sculpr, York (either John I or John II) English inscription. Mary P was sister of Ann & Richard; Mary S daughter of Richard. 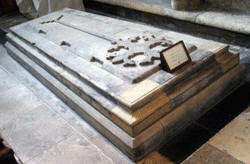 All buried in the Minster. Canon Samuel Terrick MA (1719) Latin inscription. 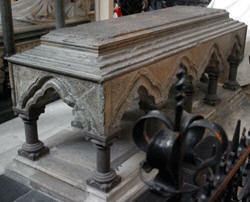 Buried in the Minster, stone lost. Above:Joanna Gibson (1733) English inscription. Buried in the Minster. Below: Penelope Gibson (1715) English inscription. 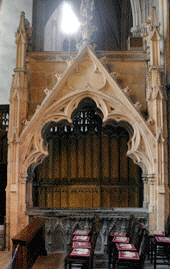 Buried in the Minster: stone lost. Many 13th - 14th century incised cross slabs, in church or built into south wall. (I presume this means exterior wall) with foliated cross and other symbols. 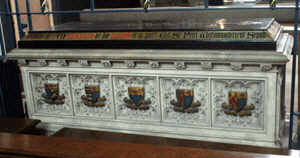 William Stokton (1471) Brass inscription. Thomas Clerk (1482) Brass inscription and symbols. Thomas Askwith (1609) Brass inscription with arms. Joshua Witton (1674) Floor slap with arms. John Etty (1708) Carpenter. Rococo cartouche; inscription. Anglo-Saxon tombstone, fragment. 9th-10th century. Coffin lid 13th century with floriated cross and other symbols. Thomas Danby (1458) Brass inscription. Lyonel Elyot (1689) Floor slab with incised cartouche with arms. 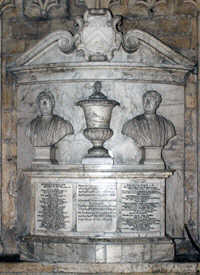 Lady Frances Graham (1721) White marble sarcophagus with heraldic cartouche. Attrib: Charles Mitley. Rev James Dallin (1838) Wall tablet. Signed: Fisher. James Fryer (1840) Wall tablet. Signed: Fisher. Some 13th century grave slabs with various symbolism. Elizabeth Ann (1760) Lozenge, marble in stone frame. Mary Swinburne (1761) Pedimented frame. Dr John Burton (1771) Inscription on marble parchment, over a Gothic tablet. With books and urn. Elizabeth Scarisbrick (1797) Semi-circular tablet with brown marble border on black marble background, cornice and urn by Thomas Atkinson. 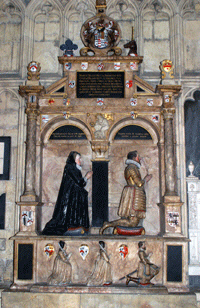 Sir Robert Watter (1612) & Margaret (1608) Limestone tomb chest of 1610. Canopy with putti and arms supported by Corinthian columns. Recumbent effigies: male and female civilians. On back wall kneeling child and babies. Inscription flanked by Faith and Peace figures. Roger Belwood (1694) Inscription flanked by books; arms above. Sir Tancred Robinson (1754) Sarcophagus with Lord Mayor's regalia, seated cherub, portrait medallion, anchors and cannon. Obelisk with cartouche of arms. Henry Waite (1780) Tablet with large portrait medallion; each side pedestals with rams' heads atop and wreathed in ivy . By John Fisher. The early fifteenth church was partially demolished in 1887 but the parish room, built in 1888 incorporates part of the north wall of the church. Dorothy Hughes (n/d) Kneeling female in niche flanked by four niches with the three Virtues; inscription above on round headed tablet topped by skull, putti and down turned torches; below winged figure with palm leaf and crown. 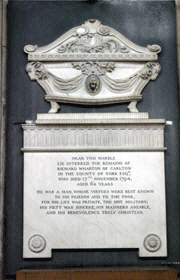 Nathaniel Wilson (1726) Marble tablet with semicircular arch and cherub's head below. Samuel Dawson (1731) Pedimented frame with arms, scroll and crossed palm fronds. 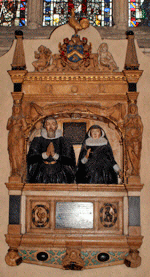 Sir William Sheffield (1633) & Wife (1636) Two busts flanked by statues of Charity and Mercy. Mary Woodyeare (1728) Cartouche curved to fit round free standing pier. Arms, cherubs' heads, wing death head. Others by Fisher, Skelton, Taylor & Tilney. Details to follow. John Wood (1704) Tablet: coloured marbles, scrolls, broken pediment and cartouche of arms. William Thornton (1721) Joiner and architect. Oval with cherubs' heads, flaming urn and garlands. He was responsible for the design of the large wooden structure which restored the north transept front of Beverley Minster into position in 1719. George Hutchinson (1775) White oval panel on gray backing; urn on obelisk above. There are a number or churches ⁻ ¹ in England called minsters the word being derived from the Latin term monasterium, meaning monastery. In fact you may read from time to time that a minster is a former monastic church; this is not strictly correct as the church here in question - York Minster - was never a monastic church and if you consult the list of minsters in footnote (1) the explanation becomes even more confusing. In Early English the words monasterium and mynster appear to have been used interchangeably and were applied to all types of Christian communities. However it must be stressed that in Modern English the word monastery does not have the same connotations as either the Latin monasterium or the Old English mynster. In the 10th century a difference between a church and a minster began to emerge:, the word mynster then being used for a 'superior church'. By the middle of the century, with a revival of monasticism, minsters were often refounded as monasteries (in the modern sense), as collegiate churches or as actual cathedrals. 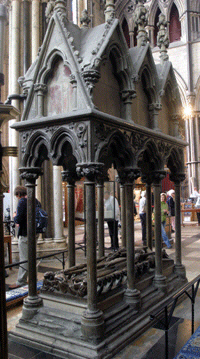 In the later 20th and 21st centuries several churches were given the honorific title of minster as an recognition of their importance. Thus the title minster has no real significance today and no difference in church law. In this it somewhat resembles that between a town and a city. Just to confuse: Westminster Abbey was an abbey, ruled by an abbot, then actually a cathedral for a short period at the time of Henry VIII, then a surviving example of a collegiate church, ruled by a dean. And a royal peculiar. As well as being very expensive to visit! ⁻ ¹ For example: Lincoln and York (both cathedrals from the earliest of times); Ripon and Southwell (both elevated to cathedral status in the 19th century and both formerly collegiate churches); Beverley, Hemingbrough, Howden and Wimborne (all formerly collegiate churches); St Andrew's, Ashington, Reading, Stonegrave, St Gregory's (near Kirkbymoorside) and Warminster (all parish churches). There are also a number of parish churches which became minsters in recent times, including Cheltenham, Halifax, Hull, Leeds and Plymouth and several others. The words minster is also preserved in some place names, such as Axminster, Exminster, Kidderminster Minster Lovell and Wimborne Minster. The Photographs were taken by the Webmaster; the drawing of William of Hatfield was executed the Webmaster and based on an etching by Charles Stothard.